“Witness Tree Project” leaders Daniel Cavicchi (left) and Dale Broholm with objects made by RISD students from the old diseased elm (top) cut down two years ago at the Frederick Law Olmsted National Historic Site in Brookline. An old elm tree that met its end two years ago at the Frederick Law Olmsted National Historic Site in Brookline might have been headed for the chipper, but two faculty members at Rhode Island School of Design had a better idea. The elm, designated as a witness tree by the National Park Service because it was present as history was made, provided material for the Witness Tree Project, taught each fall by RISD associate professor of American studies Daniel Cavicchi and artist Dale Broholm, a senior critic in the school’s furniture design department. 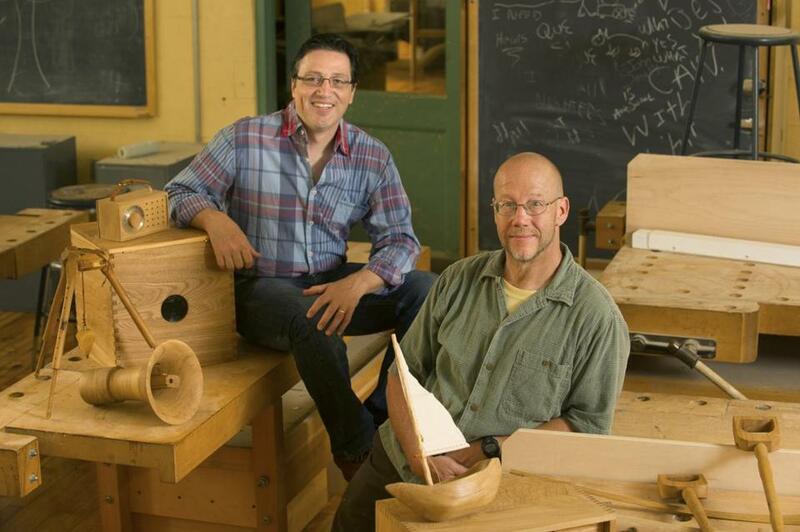 Undergraduates took two classes, one in history and one in woodworking. They visited the site, studied Olmsted, often recognized as the father of landscape architecture in the United States, and made objects inspired by what they learned. Many of those objects are on display in the exhibit “Echoes of the Olmsted Elm,” which opened Aug. 31 at the Olmsted Site. 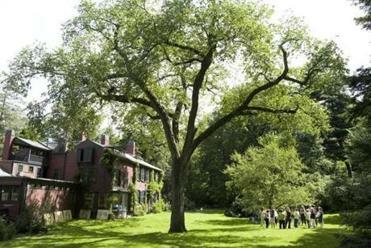 The slender tree stood on the sloping lawn of the Brookline farmhouse Olmsted bought in 1883. He redesigned the space, taking out some old fruit trees and two other elms, but retained the one that became known as the Olmsted Elm. He lived there with his wife for 12 years, during which time he worked on the Emerald Necklace. He also built out the farmhouse and ran a thriving landscape design practice on the property, which his sons and others continued there for decades; the firm shuttered in 1980. That’s when the National Park Service took over. In late 2010, the elm, approaching 200 years old, showed evidence of Dutch Elm disease and was succumbing to fungal disease. The National Park Service took the tree down. The National Park Service has an informal agreement with RISD, so that when a witness tree nears the end of its life, parks may contact Broholm and Cavicchi. So far, the two have conducted Witness Tree Projects at the Hampton National Historic Site in Maryland, which was once a plantation, and Sagamore Hill National Historic Site on Long Island, summer home to Theodore Roosevelt. Each class is tailored to what the particular site has to offer. Students learned about the rise of wealth and refinement in the United States as symbolized by the Hampton site. For Sagamore Hill, the topic was the memorialization of presidents. The topic could not have been better timed: Just as the students were arriving at RISD last fall, the Occupy movement revved up. 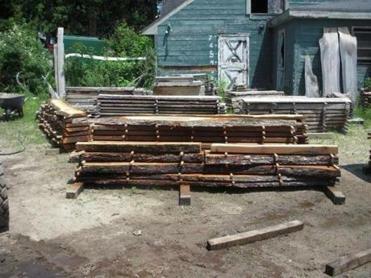 Wood from the Olmsted Elm after it was processed at a saw mill in Lunenberg last summer. 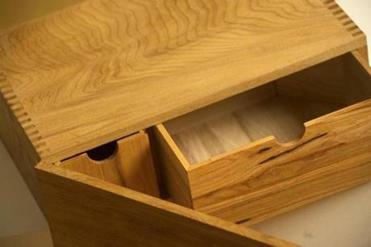 Using wood from the elm, the students undertook three projects. First, they studied Olmsted’s broad resumé — in addition to being a landscape architect, he worked as a journalist, a sailor, and a haberdasher — and they fashioned objects inspired by one of those trades, such as an ax and a walking stick. Next, they researched the history of recreation, and they crafted sculptures based on leisure activities at parks from then until now, such as a bow, a toy boat, and a transistor radio equipped with an MP3 player. Finally, students examined the questions prompted by public use of public spaces. For the students, the study of history shed a new light on their design choices. A bonus army box, built by RISD student Karl Sippel, made of wood from the Olmsted Elm. This fall, the Witness Tree Project goes to Hyde Park, N.Y., to visit the homes of Eleanor and Franklin Delano Roosevelt, where wood from maple, red oak, white oak, and black locust trees has been saved for their use. Without the Witness Tree Project, the felled witness trees would be destroyed.